There is only one place in the world where a couple can marry in Japan, take newlywed photos in Morocco and celebrate with fireworks in France – Walt Disney World Resort’s Epcot theme park. A Disney fan all her life, Mountain Brook native Tatum Clanton Kang was working in San Fransisco in computational media and game design when she met Kevin Kang. The two worked at Zynga, a social game developer known for online and mobile games such as Words with Friends and FarmVille. Tatum wore Vera Wang and her father wore a custom Scottish kilt to honor the family’s roots. Photos courtesy Tatum and Kevin Kang. They became engaged and Kang started to ponder the idea of a Disney wedding. The notion of Disney with its princesses and animated sidekicks was only part of what had the couple excited about getting married in the “most magical place on earth”. Kingdom Hearts is a video game developed by Square Enix and a partnership with Disney. The couple wanted to personalize the wedding by giving a nod to one of their favorite virtual worlds. “There is a lot of Disney stuff in the game. We tried to keep it vague and not too cheesy,” Kang said. While a destination wedding may seem complicated, the wedding professionals at Disney put the Over the Mountain family at ease. 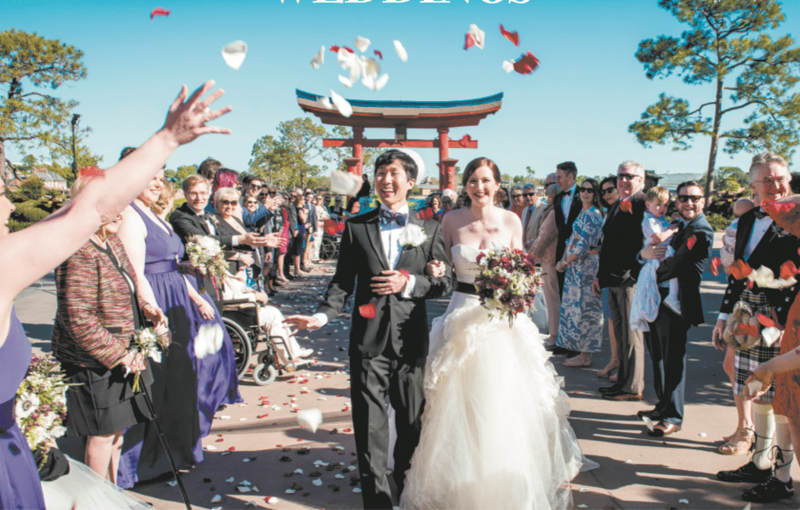 Tatum and Kevin Kang exchange vows in front of a traditional Japanese pergola with Epcot’s iconic geodesic sphere in the background. Kang said then-fiancé Kevin was on board. “He thought it was a little unconventional but said it sounded cool. He also really likes Epcot but he’s not as much into the Magic Kingdom,” she said. 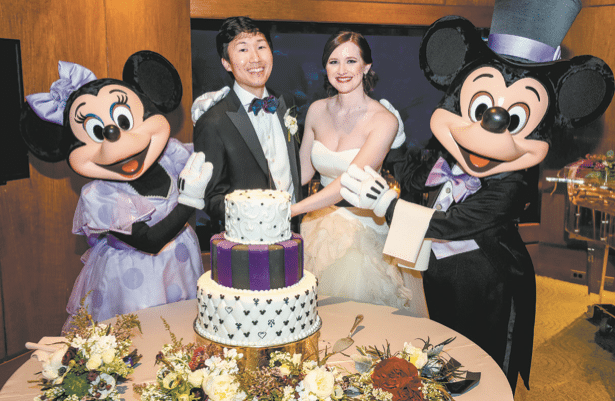 Kang wouldn’t describe herself as someone who had always dreamed of a fairytale wedding with a big poofy dress, but once she decided to get married at Disney, things started to change. Mickey and Minnie Mouse stopped by to help the couple cut the wedding cake. “I had always said I wasn’t going to spend a ton of money on a wedding dress, but I tried one on. It was Vera Wang and it was worth it,” Kang said. The wedding was planned for spring, but Kang describes her wedding colors as a more of an autumnal palette of dark reds and purples. On a brisk spring day, the men wore tuxedoes and the bridesmaids wore royal purple Vera Wang dresses. “My niece was the flower girl. She got to wear a super poofy tulle dress,” Kang said. Of course, no Disney wedding would be complete without a horse-drawn carriage. “We had a horse-drawn carriage bring me and my dad in. I rode horses for 11 years, so it was really neat to have a horse in my wedding,” she said. 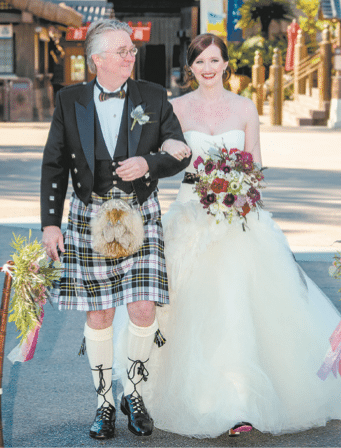 The bride’s father chose to forego the tuxedo in favor of a different kind of formal wear. “My dad is super proud of our Scottish heritage and so he wears his kilt whenever he gets a chance,” Kang said. After the ceremony, in which the couple exchanged personalized vows, the wedding party and guests traveled to the France pavilion for fireworks and desserts. Naturally, Mickey and Minnie Mouse stopped by for a dance or two. 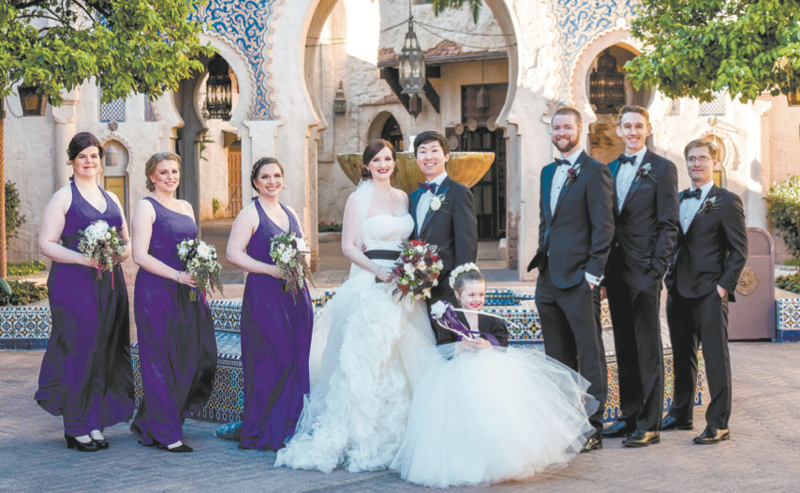 While the wedding day took place in Epcot, the couple also was able to get photos that placed them on the sets of some favorite movies and Disney attractions. “We were able to do a separate photo shoot on a separate day at Hollywood Studios,” Kang said. After the wedding in Orlando last spring, the couple returned to their San Fransisco lives as husband and wife. They plan to live happily ever after.